Every so often, I read about someone who lived a penurious life, saving every nickel, never allowing themselves the slightest luxury. The cleaning woman who worked every day of her life, never took a vacation or bought a fancy dress, died and left a fortune of $10 million to a college that she hadn’t even attended. The “millionaire next door” who lived in a modest house, wore modest clothes, and left a $35 million fortune to her heirs. The relatives of these people were always shocked at the size of their fortunes, never having guessed at the riches they hoarded yet refused to enjoy. Newspapers wrote their stories, bemused over their life choices. These are painfully sad stories, the other side of the spectrum from the lotto winners who splurge their millions on spending sprees until they’re broke again. The purpose of money is neither the relentless hoarding to hold on to every penny nor the frantic spending to get rid of it. It is the equal balance of prudent saving for the future and fun spending in the present. “Give up the daily cappuccino!” some financial advisors cry. “If you save that three dollars every day, with compound interest in fifteen years you’ll have $36,000 in the bank!” But maybe that cappuccino really starts your day off happily on a positive note. Maybe it makes you feel good to treat yourself to your special coffee at the neighborhood café so that you’re reminded that you are special and deserve some special goodies from all your labor. The manicure that makes you feel pampered, the massage that relaxes your body, the lunches with friends and co-workers—these are the little things that can make your life rich with pleasure. You need to have “Spree Money” on your budgets. It’s part of keeping balance in your life. It’s a reminder that money can buy fun, and you deserve to have some. Have “Spree Money” allocated even on low budget, for if there is none, you will feel trapped, broke, envious of others, and focused on lack and limitation. A little “Spree Money” will keep you reminded of the pleasures available in life, and the smarter you get about making money, the more pleasures will be available to you. If you just hoard all your money and never enjoy it, someone else will. After you’re gone. I’m sure glad she didn’t wait until retirement age to have a good time. She, dad and the family went out to dinner, put on parties, had weekend getaways with friends, took us on vacations across country to visit relatives, traveled, and played golf. Every day in the news, I see people who have passed from this life. Some early, some late. I mourned Glenn Frey of the Eagles, Alan Rickman, David Bowie, Anne Meara, Maureen O’Hara, James Best, James Horner, and especially Leonard Nimoy. None of us knows the time of our passing, only that it will come.When told life is a journey not a destination, someone said, “You’d better enjoy the journey – the destination of life is death.” Yowza. I never thought of it quite like that, but it’s true, isn’t it? So even if you’re on Low Budget right now, make sure you have some spree money in your pocket that you don’t have to account for, that you can spend on a hot chocolate or an ice cream cone, depending on the weather and your inclination. Buy something cute and fun that catches your eye. 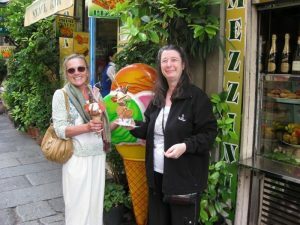 I have to tell the story of the $25 ice cream cones we bought on vacation in Rome. No, we didn’t know they cost $25! We just saw the shop beautiful shop filled with delicious goodies. They piled their cones high with various luscious flavors and then topped them off with flags, Eiffel Towers, curlicues, etc. We were enamored and kept piling things on. We had no idea what we had spent until we went to the check-out counter. We were so shocked! But you can’t take back an ice cream cone, so we just giggled and laughed and ate them up. 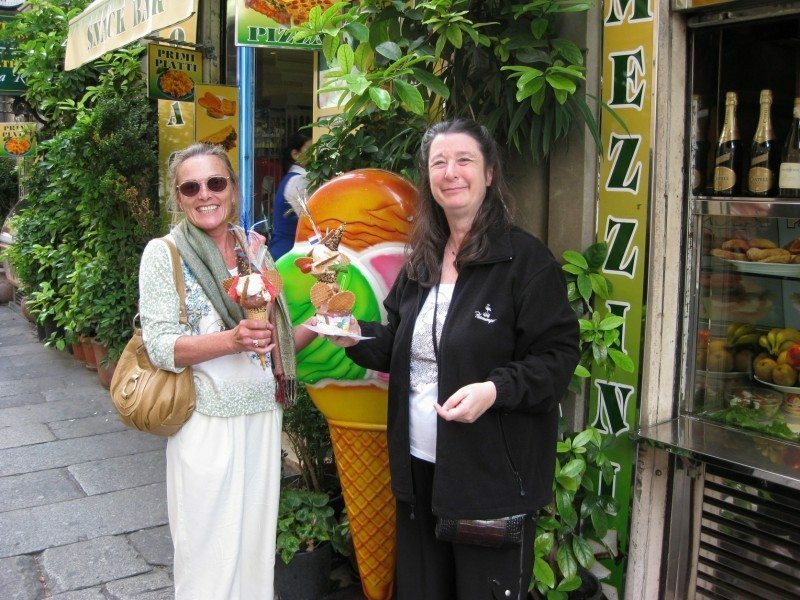 Our friends back home laughed when I said our trip was on the “Shelley Lavender-see-Europe-on-$2,000-a-day plan.” Hee. No, we can’t splurge all our cash the minute we get it. We want to have some money and resources saved in case we make it to “Super Senior” status, as my 92-year-old dad calls the stage of life after 85. But I see too much money in the bank as just a lot of wasted opportunity. So today, go splurge a little with my blessings! What would you like to have a little spree with today?